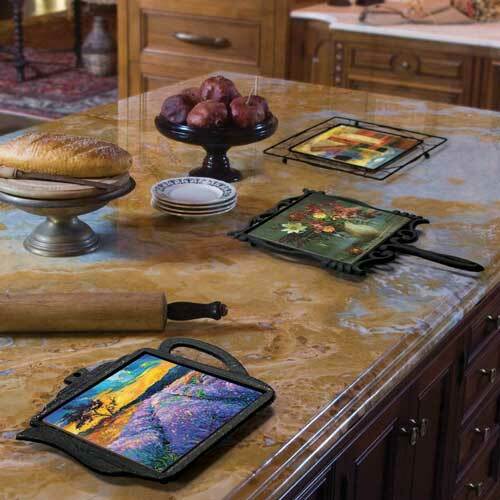 Black wrought iron trivets, also referred to as pot holders, are the perfect custom decor piece for any kitchen to display your artwork or photography. We offer a variety of shapes and sizes. A trivet allows you set hot dishes, pans, and pots on the countertop or table. These trivets are made of wrought iron and have a ceramic tile placed in the center. The ceramic tile is sublimated with your artwork or photograph. It is not only practical but provides an personalized custom art piece. Black wrought iron metal trivet pot holder, square. Your artwork or photo is printed on a 4 inch ceramic tile as the center piece. May be easily hung on any wall. Order a variety to decorate your kitchen. Black wrought iron metal trivet pot holder, square, with handle. Your artwork or photo is printed on a 4 inch ceramic tile as the center piece. May be easily hung on any wall. Order a variety to decorate your kitchen. Black wrought iron metal trivet pot holder, square. Your artwork or photo is printed on a 6 inch ceramic tile as the center piece. May be easily hung on any wall. Order a variety to decorate your kitchen. Black wrought iron metal trivet pot holder, square, with handle. Your artwork or photo is printed on a 6 inch ceramic tile as the center piece. May be easily hung on any wall. Order a variety to decorate your kitchen.